One of the most contentious issues of the JFK debate has always been the question of the validity of CE-399, the bullet which the government claimed, passed through President Kennedy and Governor Connally. Critics have argued that it was not possible for the bullet to have passed through both victims and emerged in near pristine condition. Perhaps more significantly, CE-399 contained no traces of blood or tissue when examined under a microscope. Government defenders countered with the argument that tests have proven that it was not impossible for a bullet to remain in good condition under such circumstances and that it was also possible that there would be no evidence of blood or tissue. As such, the debate has remained in stalemate for nearly half a century. But in more recent times, a far stronger case against the legitimacy of CE399 has emerged. As we shall see, it also happens to be a conclusive indictment of the integrity of J. Edgar Hoover's FBI. Mr. SPECTER. Will you mark with a "B" the stretcher which was present at the time you pushed stretcher "A" off of the elevator? Mr. SPECTER. Where is the men's room located on this diagram? Mr. TOMLINSON. It would be right there (indicating) beside the "B" stretcher. Mr. SPECTER. Would you draw in ink there the outline of that room in a general way? Mr. TOMLINSON. Well, I really don't know. Mr. SPECTER. And would you mark that with the letter "C"? Mr. SPECTER. That's fine. What happened when that gentleman came to use the men's room? Mr. TOMLINSON. Well, he pushed the stretcher out from the wall to get in, and then when he came out he just walked off and didn't push the stretcher back up against the wall, so I pushed it out of the way where we would have clear area in front of the elevator. Mr. SPECTER. And where did you push it to? Mr. TOMLINSON. I pushed it back up against the wall. Mr. SPECTER. What, if anything, happened then? Mr. TOMLINSON. I bumped the wall and a spent cartridge or bullet rolled out that apparently had been lodged under the edge of the mat. Mr. SPECTER. And that was from which stretcher? Mr. TOMLINSON. I believe that it was "B". Tomlinson passed the bullet to his supervisor, Mr. O.P. Wright who also examined it and in an interview with Josiah Thompson, was adamant that it was shaped much differently than CE-399. This is from Josiah Thompson's classic book, Six Seconds in Dallas. 'That bullet had a pointed tip.' I said, 'Pointed tip?' He said, 'Yeah, I'll show you. It was like this one here,' he said, reaching into his desk and pulling out the .30 caliber bullet pictured in Six Seconds. After Thompson showed Wright the various bullet photos and finally #399, Wright asked, "Is that the bullet I was supposed to have had?". Wright's and Tomlinson's unanimous rejection of CE-399 was further confirmed by this top secret FBI airtel, which was never shown to the Warren Commission. WFO (FBI Washington Field Office), neither DARRELL C. TOMLINSON, who found bullet at Parkland Hospital, Dallas, nor O. P. WRIGHT, Personnel Officer, Parkland Hospital, who obtained bullet from TOMLINSON and gave to Special Service, at Dallas 11/22/63, can identify bullet. Instead, the FBI told the commission that the two civilians had been interviewed by special agent Bardwell Odum, who was told by the men, that the stretcher bullet "appears to be the same one". But when Josiah Thompson and Dr. Gary Aguilar contacted the National Archives, they found no record of such an interview, in spite of the fact that the FBI was required to document interviews like that. And when they contacted Bardwell Odum in person, he denied ever conducting such an interview and stated that he had never even seen CE399. Wright gave the bullet to Secret Service agent, Richard Johnson, who in turn, passed it on to his supervisor, James Rowley. Not surprisingly, both of those men also refused to corroborate CE399, a fact which even the FBI had to admit, stating in Commission exhibit 2011, that the two agents "could not identify" it. It is interesting that the FBI never reported the reason why the two agents refused to corroborate this dubious piece of evidence. Like FBI agents, Secret Service agents were required to initial forensic evidence, and it is hard to imagine them being negligent in such an important case. By far, the best explanation for their denial is that not only did the stretcher bullet look much different than the original, but their initials were nowhere to be found on CE-399. And they were not the only ones whose initials were missing. There is no question but that only three sets of initials appear on CE-399. There is likewise no question that they have all been positively identified: RF was Robert Frazier, CK was Charles Killion, and JH was Cortland Cunningham. (See Figure 5.) It can be stated as a fact that SA Elmer Lee Todd's mark is not on the historical CE-399 bullet. "receives all of the indigent patients of this county, many of whom are involved frequently in shooting altercations, so that we do see a large number of that type patient almost daily". But it appears that the FBI didn't think about that when they received the stretcher bullet at their labs on Friday night. And when they discovered that the bullet didn't match Oswald's rifle, they panicked. It was quite simple to fire a round from the alleged murder weapon into water or cotton wadding and use that bullet to replace the one that Tomlinson found. That would explain the near pristine condition of the bullet, the absence of blood and tissue, the missing initials of SA Todd, and those of the two Secret Service agents, as well as the adamant rejection of that bullet by Tomlinson and Wright. But there is an even better reason why we can be quite certain that CE399 was not the bullet that wounded Governor Connally. The real bullet was found on the second floor and recovered by a nurse, who then passed it on to officer Bobby Nolan, who then delivered it to the Dallas Police department. The confirmation of this begins with Governor Connally. This is from his autobiography entitled, "In History's shadow". "..the most curious discovery of all took place when they rolled me off the stretcher, and onto the examining table. A metal object fell to the floor, with a click no louder than a wedding band. The nurse picked it up and slipped it into her pocket. It was the bullet from my body, the one that passed though my back, chest and wrist and worked itself loose from my thigh. There was enormous significance to that scrap of metal, but I can't be certain how many years later I understood the importance of it. I have always believed that three bullets found their mark. What happened in the hospital demonstrated how easily a bullet could have been swept aside and lost..
What the governor obviously didn't realize however, is that the bullet was not "swept aside". Certainly, the nurse who recovered it would not have just discarded the most important piece of forensic evidence she had ever handled. As it turned out, the Dallas District attorney arrived at the hospital, eager to find out how his old friend, Governor Connally was doing. It seems that he arrived at about the same time that the surgery on the governor was completed, when he ran into that same nurse who found the bullet. This is from an interview of Dallas District attorney, Henry Wade, by the Dallas Morning News. I also went out to see (Gov. John) Connally, but he was in the operating room. Some nurse had a bullet in her hand, and said this was on the gurney that Connally was on. I talked with Nellie Connally a while and then went on home. Q: What did you do with the bullet? Is this the famous pristine bullet people have talked about? A: I told her to give it to the police, which she said she would. I assume that's the pristine bullet. The nurse promptly carried out the district attorney's instructions, passing the bullet to the nearest uniformed officer in sight, who happened to be Dallas Hwy Patrolman, Bobby Nolan, who was standing in the hallway talking to Connally aide, Bill Stinson. This is from my interview of Nolan in 2010. I was talking to a man who was one of governor Connally's aides. His name was - I think it was either Stinton or Stimmons (Bill Stinson). And he was an aide to the Governor. And she came up and told him that she had the bullet that came off of the gurney. Now I don't know what gurney. I think they meant Governor Connally's gurney. And she said, "What do you want me to do with it?" He and I were just sitting there in the hallway talking to me and said, "Give it to him"
Q. Was it a bullet fragment or a complete bullet? Nolan: I don't know. It was a - they told me that it was a bullet. And I don't know if it was a fragment of a bullet or a whole bullet because it was in a little, small brown envelope. And it was sealed and it was about, I'd say 2 by 3 inches. And it was in that envelope when I got it and I never did look at it or anything." Q. Now when the nurse gave it to you, did she describe it as a bullet fragment or as a bullet. Nolan: Uh no. She just said it was a bullet. That's all. 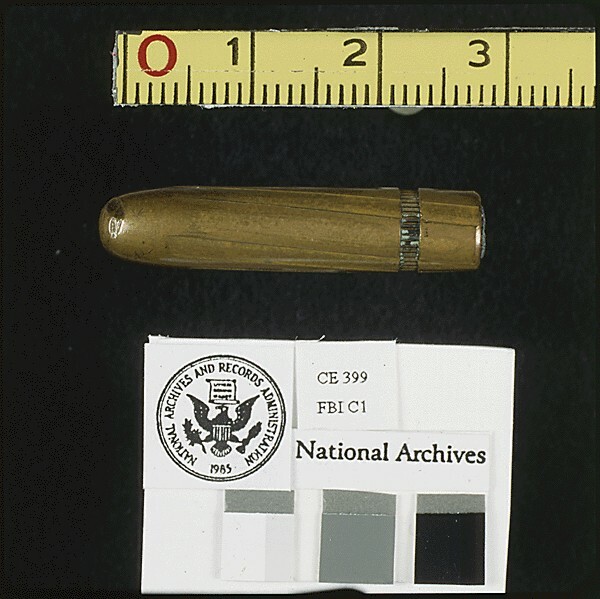 Nolan delivered the bullet to the Dallas Police department that evening, and the next morning, was interviewed by the FBI, who reported (emphasis is mine), Bobby M. Nolan, Texas highway patrolman, Tyler district, was interviewed relative to a bullet fragment removed from the left thigh of Governor Connally, which was turned over to him at Parkland Hospital in Dallas for delivery to the FBI. Nolan stated his instructions were apparently not clear at the outset and that following contact with his superior officers while at the Dallas Police Department, he turned the bullet fragment over to Captain Will Fritz [Dallas Police Department.] at approximately 7:50 p.m. He stated he had no further information concerning the matter and that his only participation in this series of events was the acceptance of the fragment and delivery of same to Captain Fritz. 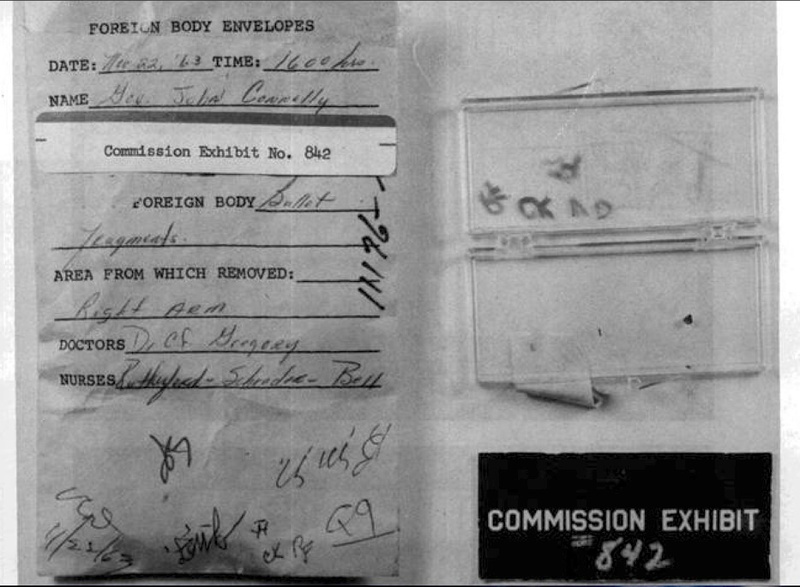 Obviously, Nolan told the FBI, exactly what the nurse told him - that the envelope contained a bullet from Governor Connally's gurney, which as the Governor himself stated, had fallen out from the wound in his "thigh". So, by Saturday, the FBI had already received the bullet that Tomlinson found and had plenty of time to analyze it and confirm that it was not from Oswald's rifle. A second Connally bullet would provide indisputable proof of multiple snipers. At roughly the same time that this nurse was passing the bullet from Connally's leg to Nolan, nursing supervisor, Audrey M. Bell was processing four tiny fragments that were removed from the governor's wrist by Dr. Gregory. She told the HSCA and later, the ARRB that she removed the fragments from a container on the scrub nurse's desk and placed them into an envelope, which she filled out and then gave to two plain clothed agents who came into her office. She was unsure whether they were from the Secret Service or the FBI, but was certain they were not in uniform. She said that both she and one of the agents, initialed the envelope and that the two of them then signed a receipt. All of this was standard operating procedure at Parkland, which Bell had carried out hundreds of times in the past. When shown an FBI FD-302 dated November 23,1963 (Agency File Number 000919, Record # 180-l 0090-10270), she felt it was inaccurate in two respects: it quotes her as turning over “the metal fragment (singular),” whereas she is positive it was multiple fragments - it says she turned over the fragment to a Texas State Trooper, whereas she recalls turning it over to plainclothes Federal agents who were either FBI or Secret Service. But according to the National Archives, there is no record of the ARRB ever finding that receipt and the Archives were not able to find it either. So Bell's receipt, which would have confirmed the name of at least one of the men she gave the envelope to, and which had to have been taken by the FBI, seems to have evaporated. This is the FBI report, allegedly from their interview dated, 11/23/63 with Audrey Bell. One thing that is beyond dispute is that the FBI's references to a single fragment, could not be true. It makes no sense that Bell told them that. Even if we speculate that she was hopelessly confused, the envelope which the FBI tells us was filled out by Bell, clearly states that it contained "Bullet fragments" from Connally's "Right arm". And we can easily see that the clear plastic container that was in the envelope, contained four tiny particles. The only logical explanation for why the FBI would have deliberately misrepresented Bell by claiming she reported only a single fragment is that the interviewer was not really concerned about the envelope that she actually handled. They were much more concerned about another envelope which did indeed, contain a single bullet or fragment (very likely, a badly mangled bullet) from Governor Connally's thigh. In order to make that inconvenient bullet and envelope go away, they only needed to claim that the envelope Bell gave to one of their agents, was the one that Nolan received. All that was missing was the three capital letters from Nolan's initials, which could be easily forged and copied onto CE-842. The other FBI claim that Bell denied, was that she passed the envelope to the fully uniformed officer Nolan. If we believe the FBI, then we must believe that Bell not only forgot that she gave her envelope to Nolan on 11/22, but that she also forgot that she told the FBI that, the next day. She also would have to have suffered the delusion that she gave the envelope to plain clothed officers who came into her office. All of these discrepancies have to have been the result of either deliberate deception by the FBI or a hopelessly incompetent and forgetful Audrey Bell. 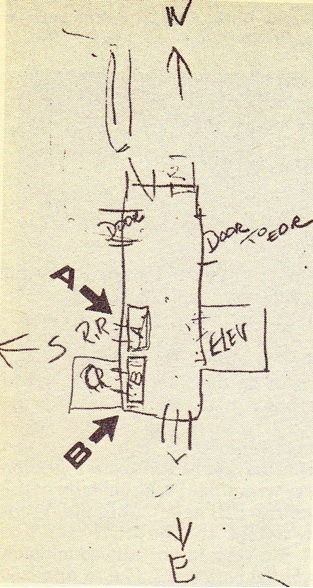 If Bell was the problem, then she not only forgot virtually every aspect of how she processed those bullet fragments on 11/22/63, but during the minutes between filling out that envelope and her encounters with DA Wade and officer Nolan, she forgot that she had just written "bullet fragments" from the "Right arm" and told both of those men that it contained a single bullet from Governor Connally's gurney, that originated in his left thigh. And then Nolan somehow didn't notice that the envelope he carried around the rest of the day and turned in to the DPD, was clearly labelled as containing multiple fragments from the right arm. Mr. SPECTER - What did you do, Dr. Gregory, with the missile fragments which you removed from his wrists? Dr. GREGORY - Those were turned over to the operating room nurse in attendance with instructions that they should be presented to the appropriate authorities present, probably a member of the Texas Rangers, but that is as far as I went with it myself. He (Doctor Gregory) stated he did not on his own knowledge know, however, but he had been advised [that] Miss Bell obtained a receipt from State Trooper Bob Nolan [a State of Texas highway patrol officer] and transferred the metal fragment to him in accordance with instructions from the Governor's office at Parkland Hospital. As a full time emergency room physician, at Parkland, it seems strange that he could never provide a straight answer, regarding this nurse who worked with him every day. Why is it that he could only answer that he "had been advised"? And why was the source of his advice, unnamed? At the request of Dr. Burkley, the President's physician, Parkland Doctor, Kemp Clark researched and prepared a report on 11/23/1963, describing events at the hospital related to the treatment of Connally and President Kennedy. For many years, it was filed away as "Top Secret". In this section, he describes what Drs. Shires and Duke, who assisted Gregory, told him. In the first sentence of the cited segment, "he" refers to Shires. "I called Dr. Duke, the resident who was present when I talked with Dr. Shires. He had heard our conversation, and had assisted Dr. Shires with this part of the surgery. 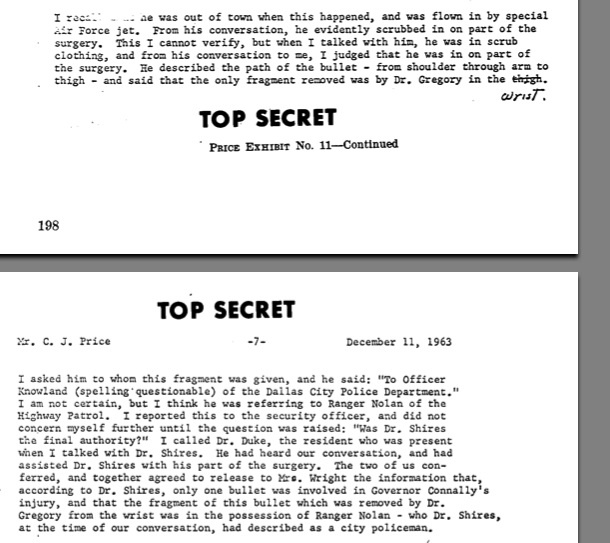 Two of us conferred, and together agreed to release to Mrs. Wright the information that according to Dr. Shires, only one bullet was involved in Governor Connally's injury and that the fragment of this bullet which was removed by Dr. Gregory from the wrist was in the possession of Ranger Nolan." The wording here is fascinating and much more informative for what it doesn't say than what it does. Notice that there is no straightforward declaration that Bell passed the wrist fragments to Nolan - only that the doctors, "agreed to release to Mrs. Wright the information that..". And why was there, just one day after the assassination, this concern that "only one bullet was involved in Governor Connally's injury"? That sounds much more like something the FBI would be worried about than the doctors. And why were they parroting the FBI's mistaken claim that this was just a single fragment, rather that multiple fragments, as was clearly written on the envelope Bell was supposed to have filled out? And why is there no mention anywhere in the report about what supervisor, Audrey Bell had to say? She was on duty that day and just a buzz on the intercom, away. Why wasn't she asked? Had she actually said what the FBI claimed she said, she would have been eager to confirm that she gave the wrist fragments to Nolan. It would not have been possible for the FBI to have pulled this scam, without the help of a least a doctor or two and probably, the nurse who actually recovered the Connally bullet. Of course, the notion that Parkland doctors or nurses were involved in a sinister coverup, is absurd. What is not so absurd however, is that like many others, they were told that if the investigation proved that there was a conspiracy, it would point to Fidel Castro and lead us into a crisis that could incite a nuclear, world war. In 1963, nuclear war was a fear that we all had to live with, every day of our lives. It was powerful enough to make even the most honest person, tell a little white lie if he was convinced that it was for the benefit of humanity. The notion that Bell handed over an envelope containing Connally's wrist fragments to officer Nolan, fails in pretty much every conceivable way. Not only does that contradict what both Bell and Nolan told us, but there is no statement on record by any of her coworkers that she did such a thing, and no record of any of them even claiming that she said she did such a thing. But perhaps, what is stranger yet, is that no one claims to have even asked her. What is easily proven however, is that the FBI falsely claimed that Bell was processing only a single fragment. It is preposterous to think that she told them such a thing. What makes infinitely more sense is, that they needed to make an envelope go away, which really DID contain a single, large fragment or bullet. But they could not do that if her envelope only contained tiny, almost microscopic particles. And so they falsely quoted her, saying that she dealt with a single, metal fragment. And of course, their claim that she stated that she turned her single fragment over to officer Nolan, is equally preposterous. Nolan's envelope was turned in at approximately 8:30PM on 11/22/63. From then on, the FBI had unrestricted access to the evidence and the right to open and inspect it. Whatever was really in Nolan's envelope, had to have been known to the FBI, prior to their interviews of Nolan and Bell. If it had really contained tiny particles, they certainly would have said so, instead of referring to what could only have been, the singular content of the envelope Nolan delivered. The nurse who spoke to district attorney Wade and gave an envelope to Nolan could not have been Audrey Bell. Three men, Governor Connally, DA Henry Wade, and officer Bobby Nolan, all confirmed that this nurse recovered a bullet from Connally's gurney and then showed it to Wade, before turning it over to officer Nolan. The envelope Bell processed, was given to an FBI agent, which is why it was never delivered to the Dallas police department, or at least, why there is no surviving record that it was. In contrast to all of these very solid corroborations, we have 100% denial by the four men who examined the bullet that Tomlinson found, that it was CE399. Unlike many other issues related to the case, this one is not a tough call. It seems that J. Edgar Hoover agreed, because in recordings of telephone conversations between him and LBJ, he suggested that Connally was wounded because he came between the President and an assassin, and that if Connally had not come between them, JFK would have taken his bullet. LBJ: How did it happen they hit Connally? JEH: Connally turned to the President, when the first shot was fired and I think that in turning.. it was where he got hit. LBJ: If he hadn't turned he probably wouldn't have gotten hit? JEH: I think that is very likely. LBJ: Would the President've gotten hit by the second one? JEH: No, the President wasn't hit with the second one. LBJ: I say, if Connally hadn't been in his way? JEH: Oh, yes, yes. The President would no doubt have been hit! Today, we know that that scenario was not correct, but it is hard to imagine Hoover believing that Connally was hit by a different assassin, unless he had seen evidence for such a thing. The bullet or large fragment that Nolan turned in, was obviously, not from Oswald's rifle. If it was, the FBI would have flaunted it as absolute proof of the accused assassin's guilt. Instead, it provided absolute proof that Connally was hit by a bullet from a different assassin. Until recently, only Hoover and a handful of others, were aware of that.